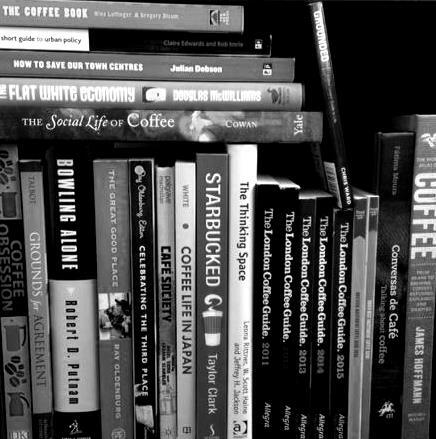 This page will over time develop a list of useful places to find out more about cafe societies, cafe culture and the development of the cafe industry. Tjora, A. and Scambler, G. (2014) Café Society. London: Palgrave Macmillan. White, M. (2012) Coffee Life in Japan. Berkeley: University of California Press. Grant, J. and Perrott, K. (2011) ‘Where is the café? The challenge of making retail uses viable in mixed-use suburban development.’ Urban Studies, 48(1): 177-195. Grinshpun, H. (2014) ‘Deconstructing a global commodity: coffee, culture and consumption in Japan’. Journal of Consumer Culture, 14(3) 343-364. Laurier, E. and Philo, C. (2006) ‘Possible Geographies: a passing encounter in a café’. Area, 38(4): 353-363. Laurier, E. (2008a) ‘Drinking up endings: conversational resources of the Café’. Language and Communication, 28(2):181. Laurier, E. (2008b) ‘How breakfast happens in the café’. Time & Society, 17(1) 119-143. Roseberry, W. (1996). ‘The rise of yuppie coffees and the reimagination of class in the United States’. American Anthropologist, 98:762-775. Waxman, L. (2006). ‘The coffee shop: Social and physical factors influencing place attachment’. Journal of Interior Design, 31: 35-53. DCLG (2012) Re-imaging urban spaces to help revitalize our high streets. Department for Communities and Local Government. Available here. DCLG (2013) High Street Renewal Fund 2013. London: Department for Communities and Local Government. International Coffee Organization (2014) World Coffee Trade (1963-2013) A review of the markets, challenges and opportunities facing the sector. International Coffee Organization. Available here. Laurier, E. and Philo, C. (2005) The Cappucino Community: cafés and civic life in the contemporary city. Final Report. ESRC Research Project. Available here. Wrigley, N. and Lambiri, D. (2015) British High Streets: From Crisis to Recovery? A Comprehensive Review of the Evidence. Southampton. Economic and Social Research Council. Available here.